Thanks to their light and fluffy texture and low-carb appeal, even those who don’t care for cottage cheese adore Kathleen’s Cottage Pancakes! High protein and low carb are typically not the words I associate with pancakes, but this recipe shakes things up a bit! A friend of The Fountain Avenue Kitchen passed this novel pancake recipe along to me, saying that it is something she makes for her husband almost every morning. The ingredients are quirky–for pancakes, anyway–but so very healthy. I simply could not pass this recipe by. The cottage cheese lends a lightness to the batter while the eggs provide exceptional protein and flavor. I loved the underlying egg flavor. Note, there’s not a speck of sugar in this recipe–and just a small amount of flour. I think next time I will try whole wheat flour, or perhaps my gluten-free blend. My dad would like these. Note: I have been asked several times if I have tried these pancakes with my gluten-free flour blend, and I wanted to provide an update. In addition to making them with that blend, I have also tried them with oats, as one friend shared that she had successfully done. That time, I used quick oats and added 1/2 teaspoon each baking soda and baking powder in lieu of the 1/4 teaspoon baking soda called for in the original recipe. While they tasted fine, the resulting pancakes lacked the fluffiness present in the original recipe. The gluten-free blend fares very well, resulting in an end result similar to the original version. I use the 1/2 teaspoon each of baking soda and powder here, too. Both times, I polled my husband and kids and they gave both versions their stamp of approval although did notice a difference with the oat version, mainly because those pancakes appeared flatter than usual. Update 4/4/18: Recently, I’ve had several readers ask about making these with almond flour. Although I have not yet tried it, my suspicion is that it would work but that the pancakes would be somewhat flatter. If you try, please feel free to comment! Thanks to their light and fluffy texture and low-carb appeal, even those who don't care for cottage cheese adore Kathleen's Cottage Pancakes! Beat eggs until light. Mash cottage cheese (Kathleen uses a food processor, I used my mini chopper to really get it smooth). Add to eggs along with the remaining ingredients. Drop by tablespoonfuls onto a lightly-greased griddle (I like to use my cast iron skillet) and cook over medium heat until browned on both sides and cooked through. Top with maple syrup or fresh fruit, as desired. Makes about 2 dozen small pancakes. I made mine a bit bigger and got 17 or 18. *If using regular table salt, you may wish to start with 1/4 teaspoon. Also, sodium contents vary among cottage cheese brands. If your brand contains a high level of sodium, I recommend using less when making these pancakes for the first time. For a healthy, aromatic option with a high smoke point, try cooking the pancakes in coconut oil. My mom made a similar cottage cheese pancake recipe while I was growing up…I love them!!! My favorite thing to do is fill them with all fruit preserves and roll them up like a crepe. So delish! 🙂 Thanks for sharing this great recipe! Loved this recipe. My son doesn’t “like” eggs so this was a great way to get him some protein. My only comment would be to leave out the salt. The cottage cheese already has salt in it so I found it too salty with the added salt. Thanks for the comment and the suggestion, Debbie. I had not noticed this, but it is especially helpful to point out for people who may be watching their sodium intake. There may be some variation among different brands, too. I will have to look next time I buy cottage cheese! Did you ever look at the ingredients in cottage cheese? Amazing. I use Daisy brand, no added ingredients. Same with tomato paste. Contadina has one ingredient…tomatoes! Check the other brands before you buy.. I agree, Mary Jane. It’s almost like yogurt…some varieties are far and away better than others. Thanks for the extra reminder! I just made these for my boyfriend and I! We both really enjoyed them! I omitted the salt but added in blueberries and some cinnamon! Delicious, thanks for a great recipe! So glad you both enjoyed them, Carina! Thanks for letting me know…I bet they were wonderful with the blueberries and cinnamon! Another Fountain Ave hit in my house! I didn’t tell the kids I made a different recipe until I had rave reviews from all of them. They all agreed these were better than ones made from a store bought mix. You sound just like me, Betsy…waiting to divulge the change until they have taken a few bites. Love it! I’m glad this went over so well! So glad you enjoyed them, Viviana! Thank you for letting me know! I dont have a food processor – is there something smooth I can try instead of cottage cheese? Good question, Maria! You can try mashing really well and then mixing as directed. I am also thinking you could try beating it with a hand-held mixer. Let me know if you try! You could try ricotta cheese! I’m thinking you’re referring to the cottage cheese, Kim? You shouldn’t have to strain it, but if your cottage cheese seems watery you could pour the excess off the top. U can use a nutribullet or blender as well. That should be fine, Stephanie! Use farmer cheese! Same health profile as cottage cheese, so not as fatty as ricotta, and dryer and smoother. An old La Leche League cookbook (Whole Foods for the Whole Family) has Blender Cottage Cheese Pancakes recipe pretty much like this. You can also make it with oats instead of flour, and add a banana in the batter if you want it sweeter. That is so good to know, Sarah. Thanks for the comment. I will have to try this with oats instead of flour. My father, who cannot eat wheat, would love them! So happy you loved these, Kerry. Several commenters have used almond flour with good results – although likely a little less rise. That might be the best option in terms keeping the carbs as low as possible. If you hit upon anything different, feel free to report back! Hi Regina, I’ve heard about that cookbook but have never read it. Would be fun to see! So happy these were a hit then and that you found them again! You probably could use farmer’s cheese. The texture is already smaller for those of us without [mine is broken] a food processor. That is the cheese in blintzes, and pierogies. I can’t wait to try this because I can never eat regular pancakes. I get too much of a sugar rush. Your protein pancakes just might work! Great suggestion and I hope you enjoy them, Sandra. If you like pumpkin, I highly recommend Baked Pumpkin Pancakes, too. That is another non-traditional recipe that is (I think!) delicious. How many carbs do each of these contain? Can you give me somewhat of a round about guess? I have not calculated nutritional information but several people have mentioned online sources such as caloriecount.about.com and myfitnesspal.com. You might want to give these sites a try. I hope this helps…and I hope you enjoy the pancakes! We tried these this morning! Yum! Thank so much. Thanks for letting me know, Dinah, and so glad they were a hit! I hope you and your boys enjoy these pancakes as much as my boys and me, Beverley! My step-mother always made these when I brought my hungry hoard up for a visit… it was their favorite. She always made it in a blender – much easier to pour from, too. I would leave out the salt altogether since it is just the two of us now and I would only be making about 1/3 the recipe. Divvying up 1/2 t is not worth it. I LOVE the idea of oatmeal (gluten free variety) since I can’t eat gluten. One reason these would taste better than most mixes is that they often have way too much baking soda in them to be edible! Thank you for the comment, Kathleen, and love the blender idea…a great option for those who might not have a food processor! Katleen, I would add just a pinch of salt. You cannot feel it at all and it really improves the taste. These look really yummy! I am doing Weight Watchers and wish I could calculate the points. I did go on the suggested websites but it didn’t help. Thanks for the recipe! If you make 18 pancakes and use 2 pancakes as a serving, they are 3pp per serving! Hope this helps! I calculated this recipe because I am planning to make it! Thanks for the helpful information, Sarah, and I hope you enjoy them! I tried making these with non-fat plain Greek yogurt instead of cottage cheese (I was out) and thought the texture the Greek yogurt would be similar to that of mashed/blended cottage cheese. Thank you for sharing your experiment, Amanda! You never know how it will work unless you try! The yogurt does have a tartness that the cottage cheese lacks, so I think that would make the difference. If you don’t have a food processor and want to try with cottage cheese, you could try in a blender if you have one, as someone previously suggested. Thanks again for the great information! Thank you for sharing a great, time-saving tip, Gayle. Perfect for those who do not have a blender or processor as well! For Stephanie….I just figured the WW points to be only 1 point per pancake- you were almost right with your guess of zero Ann! This is based on using low fat (not nonfat) cottage cheese and getting 18 pancakes out of the batch. If using any nut flours, try adding xantham gum. ( I believe it is 1 tsp per cup of nut flour) It replaces the gluten that is missing in those flours. Thanks for the tip, France! Instead of flour, I used a combination of equal parts coconut flour and flax meal. I also added vanilla extract, other than that I stuck to the recipe. I thought it was delish. Love your alterations, Beth. Thanks for sharing what you did! Has anybody tried gluten free flour, and if so, how did it taste? I have not tried this recipe with gluten free flour, Ann, although I am fairly confident the blend I use would work well. I just got more cottage cheese to try them with oats as one person has done it. When I get around to making them, I will be sure to report back! I make them with gluten free flour all the time. They turn out great. Thanks for your feedback and glad you like! Making these right now and used spelt flour and added blueberries to the batter. “Fantastic” according to my family. Thank you! I am so glad, Jan! Coincidently, I just made them, too! Tried with oats as one person had done previously and also with my gluten-free flour blend. I preferred the blend although the ones with oats tasted great…just a little more of the egg flavor and a little flatter. Perhaps I will have to try with spelt flour next! I am looking forward to trying these! I have recently been put on a gluten free diet and need help! What is gluten free flour blend and where do I get it? Can I use it to make my gravy? Being a southern cook this has not been easy. I meant to provide a link and forgot…I will provide here and above so you can see what I use. Although you can buy a variety of mixes, I like to mix my own as I have had mixed success with store-bought varieties. I use this mix (a blend of rice flour and a few other ingredients) as a cup-for-cup substitution for regular flour when I need to make a gluten-free option in my baking. It is not exactly the same, but it is rather close and, most times, people do not notice a difference. Good luck, and I hope this helps! Thanks so much for that link! I can’t wait to try these. Will try this blend when I make my cornbread also. Will let you know how that went. You are welcome, Debbie, and I would love to hear how you make out with your cornbread! 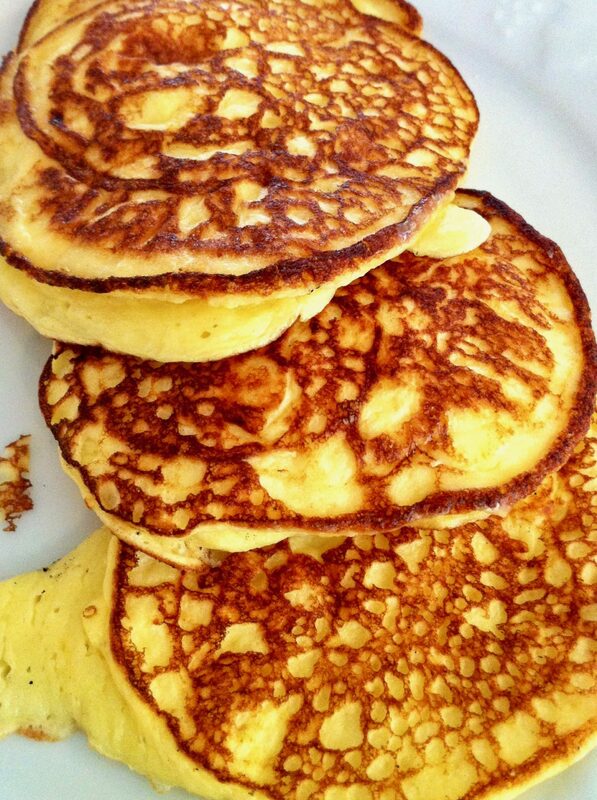 I have made these pancakes and instead of cottage cheese, I use Ricotta! very good and I think better this way. Thanks so much for a great suggestion, Lynne. The upside to the ricotta is that it need not be mashed or put in the food processor. The cottage cheese, on the other hand, is a bit healthier. Either way, two delicious options! I just tried this recipe and it was delicious and I hate cottage cheese. I just used a hand blender to smooth the cottage cheese. Amazing! I am so glad you loved these and I appreciate your helpful comment regarding the hand blender, Claire! I calculated the calories in the pancakes. It seems that the total recipe is 960 calories. If you get 24 pancakes out of it…it is only 40 calories per pancake! Thank you very much, Kylie! That sounds pretty terrific! They were awesome, the whole family loved them. I added a couple of packs of Splenda and some vanilla extract. Will definitely make again and I know a couple families with diabetic kids, going to share the recipe with them. Thanks for the recipe. I am so glad they were a hit, Dania, and am glad you can think of a few families that may enjoy the recipe, too! Thanks so much for letting me know! I noticed several mentioned using oats in this recipe…is it replacing all of the flour with oats or part? I usually make my pancakes with ordinary pancake mix but replace 1/2 of the 2 cups of the mix with oats. If you read the note I added above the recipe, you will see what I found when I used oats in place of the flour as well as my gluten-free flour blend. To me, they are best with the flour or the gluten-free mix. They taste good with all oats, but lose their characteristic fluffiness. Hope the extra details above help! Out of habit, I always buy the small curd cottage cheese although I think the large curd would work equally well, especially since it is blended or processed until smooth. Made these for breakfast this morning and they were great! I added zest of a lemon and fresh blueberries….so good. Took a while to find the correct temp to cook them at. First couple browned too quickly before insides were cooked. Rest were perfect. Thanks so much for a great recipe. Thanks for the great feedback, Lynne, and I am thrilled you enjoyed these! Your additions sound delicious! Tried these this morning and they were really good ! Oh yes, made them in the blender, so easy ! Thanks so much for the feedback, Sidi…so glad you enjoyed! I think you will like these, Beverley! Hope all is well with you and your family! Hope you don’t think spelt is gluten free because it is a form of wheat. You are right, Gloria! Thank you for the clarification. I don’t want there to be any confusion! These are amazing! Made them two weekends in a row and I really like these better than regular pancakes. I plugged in the ingredients in myfitnesspal, and they have about 2.5 grams of carbs per pancake. They keep me full for a long time because of all the protein, which is perfect for my low carb eating. Definitely my go to pancake recipe now! I am so glad you have a new favorite pancake recipe, Holly! Thank you so much for the carb information and the great feedback. I hope you find a few other recipes you like as well! Any idea if they freeze well? This is one pancake recipe that I have not frozen. I have put one or two leftovers in the fridge and reheated in the toaster oven the following day. If anyone else has frozen them, please feel free to comment! Made these this morning- delicious! Followed the recipe as written. Glad I found your site! So glad you love them, Tamara! Thank you for letting me know! I made these for my junk food junkie husband and he LOVED THEM! Thank you so much. I calculated the Weight Watchers points and if a batch makes 24 pancakes and you eat 4 per serving, that is only 3 points per serving! Thank you so much for this recipe. You are very welcome, Sheree, and thank YOU for the great comment and the WW point information. I am delighted they went over so well! I found another trick. If you add a tad bit, and I mean a very small amount, of xanthan gum to the batter, it will thicken the batter. I’d say start with 1/8 teaspoon.. It will take a few minutes for the batter to thicken. 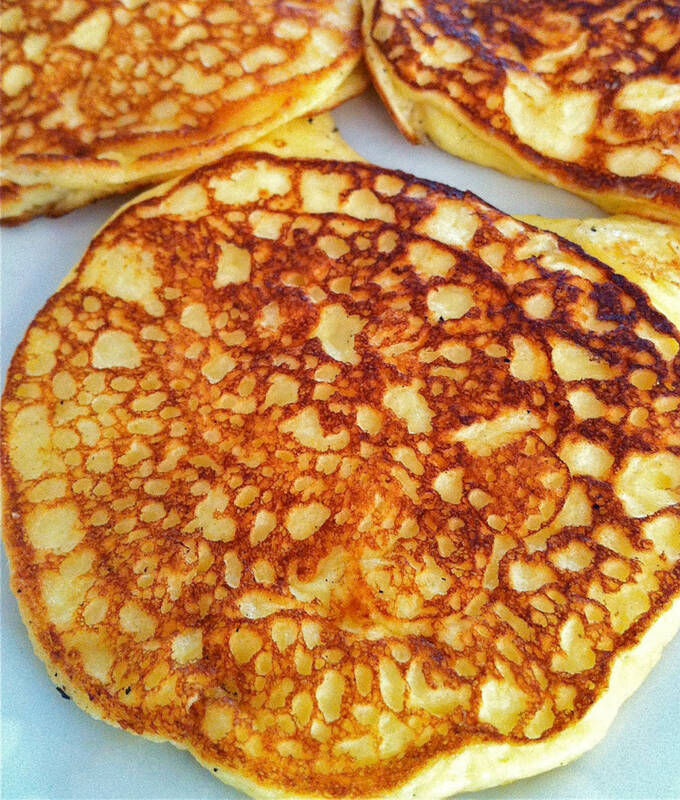 The pancakes retain their light airy texture. Do you use this trick when you are making the gluten-free version? I find the regular version to be plenty thick, so I wanted to make sure. Thanks so much for the tip and any clarification! I use half flour and half almond flour. The first day is ok, but if I finish the batch of batter the second day, it is really thin, like crepes. I only use 1/8 teaspoonful of xanthan gum for 1/2 a recipe. There are only 2 of us in our house. Thank you for clarifying and for your helpful hint! Ricotta cheese sub for the cottage cheese. Much smoother. Can’t wait to try. Very late in finding this. Ricotta would be a great substitution. Thanks for the comment and hope you enjoy them, Lisa! IF you were to make this recipe for only three people. How much of each ingredient would you use ? That is a good question, Tamara, since everyone’s appetites are so different! If you didn’t want any leftovers (which are rather good reheated in the toaster oven), I would make about 2/3 of the recipe. So, 4 eggs, 1 cup cottage cheese, and 1/4 cup plus 1 1/3 tablespoons flour. I would use a scant 1/4 teaspoon salt (could omit if your cottage cheese has a fair amount of sodium–this does vary by brand) and 1/8 teaspoon on baking soda. I hope this helps! We added just a small amount of oil ( coconut works well). And made them in a Belgium waffle maker. They were extremely yummy! Love the waffle suggestion, Linda! Thanks so much for the comment and glad these were a hit! Hi! I wonder if somebody could explain how much a cup measures in grams because it’s a great pancake but I really don’t know the portions.Thank you! Because the weight in grams varies based on the ingredient, I found this simple conversion chart that I thought may be helpful to you for this recipe as well as others. I have a basic kitchen scale which is also quite helpful, not only for easy, precise measuring, but for making conversions when necessary. I hope this helps! I am happy the link helped you. Thank you for the great feedback, and I am thrilled you enjoyed the pancakes! Do these preserve well? Could I make a bunch, then store them in the fridge or freezer and microwave to warm? I have heated the leftovers in the toaster oven and they are fantastic that way. I typically store extras in the fridge, where they will keep for quite a few days, although I would imagine they would freeze well, too. My grandmother handed down a recipe similar to this, she just added about a tbl of veggie oil. I just eat them with a little bit of butter because you don’t need syrup with them. So delicious and I didn’t know they were some what healthy!! Do you think I can prepare the batter the night beforehand it’d still be ok? I have not prepared this batter the night before but think it would be ok. If you try, please report back! Would you happen to know the nutritional info and servings/serving size per person? At this point, I do not calculate nutritional information, mostly because I so often provide a number of options with my recipes. A lot of people report liking myfitnesspal.com or caloriecount.about.com as a resource. Also, other commenters have included their calculations, such as 3 WW points and 2.5 grams of carbs per pancake (based on a batch of 24). I hope that helps a little! It must be me but in my opinion they taste weird! They don’t go with a sweet additions, not even with salty one too. I am sorry these weren’t for you. I am trying to think of what could have tasted weird. Perhaps something was off with one of the ingredients? I tried these out this morning and they were pretty good. I dumped everything in the blender and pulsed it a few times until it was smooth. It made 10 5″ pancakes. My daughter has gestational diabetes and the Dr. has said she can only have 30 carbs at breakfast. I tried these out with her in mind. In my opinion they taste similar to french toast. I am glad you tried and liked, Meme. Thanks for taking the time to comment! Sounds delicious! What are your thoughts on using a protein powder in place of the flour? That’s a great question, Sonya. My guess is they would taste great but be a little flatter, as the flour provides the gluten which creates the rise in this recipe. That said, gluten is a protein… If you try, please report back! THANK YOU! I was diagnosed Type 1 diabetic 4 years ago and have tried so many different recipes for healthy foods that I like that have turned out disappointments. I love pancakes and miss them dearly. I tried these yesterday (and am making them again today) and they are PERFECT!! This recipe has given me hope to continue searching for new healthier recipes of my favorite foods. What a great message, Sarah! I am thrilled you found this and it was a hit. I hope you find some other recipes you enjoy as well! I wonder how many carbs per serving. . I haven’t calculated the nutritional information and know preferred pancake size and portions vary widely. However, one reader plugged the ingredients into myfitnesspal and found they have about 2.5 grams of carbs per pancake. If you scroll through the comments, other readers have mentioned Weight Watcher points, etc. I hope that helps! Pingback: Cottage cheese and egg pancakes: "That child just ate two eggs and a half cup of cottage cheese and didn’t even know it"
My child just ate two eggs and a half cup of cottage cheese and didn’t even know it! Awesome!!! Love it, Kate…and glad your daughter did, too! Wondering if these freeze well? They sound delish! I haven’t frozen these because they are always eaten too quickly here, but I think they would freeze well. I have frozen other pancakes in the past–even some that aren’t traditional in their ingredients–and it’s worked well. Heating them in the toaster oven as opposed to the microwave keeps the texture nice, too. My son is an extremely picky eater and loves these pancakes! I add bulgar wheat, steel cut oats, oatmeal, mashed up bananas and blueberries to this recipe and then freeze them so we have them all the time. I love that they’re so healthy for the whole fam and delicious! Great recipe!! Thanks for the great feedback, Katie. I am thrilled these are a hit with your family and love your additions! I do protein pancakes daily but with unprocessed oats instead of flour. I also add flaxseed meal and use egg whites instead of the yolks for a lower calorie and lower cholesterol version. Yum! I bet they are delicious. Thanks for the comment, Rebecca! I make similar pancakes using my blender. My recipe has a teaspoon of sugar and no baking soda. These were great. I added a splash of vanilla and sold them as “French toast” pancakes, as that was what they reminded me of. No one need know they ate “healthy”. Next time I plan to add a little cinnamon. Sounds like a great strategy to me, Eletha, and thanks for taking the time to let me know. I’m so glad your family enjoyed! I have made these for years out if an old cookbook called Yankee hill country cooking and did not blend the cottage cheese at all. I think it called for a bit less flour. Anyway very delicious and easier if anyone wants to try it that way. Thanks for the comment, Carol, and for offering the option! Coconut flour is a little lower in carbs and I was wondering if you could use coconut flour as a substitute for regular flour. Coconut flour is really different than most other flours. It absorbs A LOT of liquid and needs to be used in different proportions of wet to dry ingredients. I wouldn’t recommend the substitution…but if I were inclined to experiment, I would start with two tablespoons of coconut flour in place of the regular flour. If you decide to play around with the recipe, I’d love to know how you make out! Thanks for the great feedback, Duchess. If you remember the precise amounts of coconut flour and oat flour you used, please feel free to mention them. Others might enjoy trying it for a vetted gluten-free option. I haven’t calculated the nutritional information for these, but one reader plugged the ingredients into myfitnesspal.com and found that they have about 2.5 grams of carbs per pancake. If you scroll through the comments, other readers have mentioned Weight Watcher points, etc. I hope that helps! I just posted the nutritional value of these in a comment I posted below if you want to check it out. Using flour doesn’t make it low carb? This is lower than traditional recipes since so much of the flour is replaced by the cottage cheese and the eggs. If you try, I hope you enjoy! I just prepared these and they were delicious. I added a tsp of vanilla extract and they tasted so yummy! I’m huge on finding low carb options and pancakes and waffles are my favorites for breakfast. I’ll have to try it with some protein powder next time but they are so yummy the way they are. I also didn’t add any salt as the cottage cheese I used was already pretty salty. Great recipe! I also just calculate the approximate nutritional value of approx. 20 of these delicious babies. I used low fat (2%) cottage cheese. This is only the value of 20 of them from the measurements used from the recipe. These values will vary, but not by much, depending on the milk fat and sodium used in the cottage cheese or the type of flour used. I did not add any salt because my cottage cheese was salty enough. I am so glad you loved these! Thank you for posting the nutritional values along with your helpful comments. I have some more low carb breakfast recipes in the works! These sound great! Im wondering what kind of cottage cheese…. low fat, curds, dry, etc? Can’t wait to try them! You can use your favorite–small curd, large curd, full fat, 2%… The curd size doesn’t matter since it gets blended. I typically buy 2% cottage cheese and love the way these pancakes turn out with that. Hope you enjoy! I have not made these with almond flour, but my guess is that the taste would be delicious but they might be a little flatter. It’s most definitely worth a try though…and if you do try, please report back! The only flour/starch I can have is tapioca or a quinoa and suggestion on how to substitute? Hmmm…if I wanted to make this recipe but only had those two flours as an option, I think I would use 2/3 quinoa flour and 1/3 tapioca starch. I can’t promise perfection since I haven’t tried, but that should approximate a good flour to starch ratio. If you try, I’d love to know how you make out, Geena! Thanks for sharing your version, Gerri. I bet they are equally delicious! That’s awesome, Jeannie! Thanks so much for letting me know. I don’t tend to calculate nutritional profiles because I so often provide numerous choices and options with my recipes. If you scan through the comments, you’ll see that a few other commenters mentioned the carb and calorie count. Also, many people like using caloriecount.about.com or myfitnesspal.com to get the information. Hope that helps! I made this recipe with a few tweaks. I mixed all this as directed. I did use my immersion blender on the wet ingredients first to smooth it out. Put coconut oil on a hot griddle pan, and dropped 2 heaping tbsp per pancake for medium size pancakes. Cooked till golden on each side. I ended up with 6 medium size cakes. Enjoyed with nothing but creamy butter on top. Thank you for your wonderful comments, Mary, and for sharing your tweaks. I’m so glad these were a success! This recipe looks amazing and I’m so happy my sister shared it with me. As a gastric bypass patient, regular pancakes have too many carbs for me but this looks great and I have been crazing pancakes. Thank you! Thanks for the great comment, Lisa. I hope you find these very satisfying! please how do I make cottage cheese or where do I get it from? Cottage cheese is available in the dairy aisle of most grocery stores. If you cannot find it, you could substitute ricotta cheese. These turned out great. Such an awesome recipe. Yay! Thanks for letting me know! This recipe has very good intentions, however, the result is an entirely too salty, flavorless pancake. I will NOT be making this recipe again. Cottage cheese, by nature, is high in sodium. The 1/2 tsp salt is not needed. The saltiness was so severe, I feel slightly nauseous eating them, the few bites I could stand to consume. I’m sorry you had such a bad result, Christina. If using table salt instead of the indicated kosher or sea salt, that can make a difference. Also, sodium contents do vary widely among cottage cheese brands, and I try to look for one that’s not exceedingly high. I appreciate your feedback and wish your results were similar to many of the others who have tried and enjoyed this recipe. Can I use egg substitute instead of eggs? I haven’t used egg substitute in this recipe, Deanna, but I think it would work. If you try, please report back! Thanks so much for sharing, Donna! Is it possible to use oat bran instead of flour? I do not eat bread and do of consume any kind of flour (might use whole wheat flour if it is much needed) ? Badly, want to try this recipe. I have made this recipe with a gluten-free flour blend but not with oat bran. My guess is that it would work but the pancakes would be flatter than if using wheat flour. If you happen to try, I’d love to know how you make out. Loved these pancakes. Shared it on my facebook page! I’m so glad, Jenna, and thank you! I made these this morning with 1/2 cup of oat bran and 1/2 cup of multi grain flour ( just the oat bran was way too liquidy) no salt. added another 1/4 tsp baking soda and they were amazing!! Fluffy inside, crispy outside. Best pancakes ever! Thanks for the recipe Ann. Thanks for the great feedback, France! any particular brand or blend of gluten-free flour you used? Before going gluten free, i used to make an amazing cottage cheese pancake from a mix I found at Trader Joe’s specifically for cottage cheese pancakes. I don’t miss a lot of bread, etc but those are one food I’d like to re-create! I ate them plain, with powdered sugar, or strawberry preserves–sort of like a crepe like another commenter mentioned. Thanks for posting! I really like this blend which I mix myself and keep on hand, Dina: https://fountainavenuekitchen.com/all-purpose-gluten-free-flour-blend/. It’s my favorite so far. I make everything from muffins and quick breads to the chocolate cake recipe on this site with it. Two other mixes that I’ve tested (although not with this recipe specifically) are Bob’s Red Mill’s one-to-one blend and Cup-4-Cup’s whole grain option. (I actually think Cup-4-Cup’s whole grain version worked better than their original blend.) Good luck and I hope these turn out like the pancakes you used to enjoy! Thank you for sharing the stats, Abbey! What a surprise seeing this recipe today! I had not thought about my recipe for these that was tucked away and forgotten about. My Grandmother made this–with a few unimportant differences (circa 1950’s). I loved these–although smothering them with maple syrup probably negated the healthfulness of the recipe! Thanks for the step back in time and the nudge to make them again. What a wonderful memory. Thanks for sharing it, Denise, and enjoy them…maple syrup and all! Can you use coconut flour in these? Coconut flour works very differently from other flour, so I don’t recommend it in this recipe. If you really wanted to experiment, however, I would start with about 2 to 3 tablespoons of coconut flour instead of the 1/2 cup of flour since the coconut flour is so absorbent and requires a greater ratio of wet to dry ingredients. Again, I haven’t tried this, so I can’t guarantee the results. If you do happen to test it out, I’d love to know how you make out! Do you know if this would work with ‘fromage blanc’. We cannot get cottage cheese here but if you mash/beat the cottage cheese I guess it would be OK. What consistency is the cheese when you beaten it? Anything like thick yogurt? Thick yogurt or fromage blanc might work, although there would likely be a slightly tangier flavor. Your best substitution would probably be ricotta cheese. If you do try with another substitute, I’d love to know how you make out. Be quite good to see a macro and calorie breakdown? There’s a nutritional calculator linked below as well as some reasons why I don’t typically provide that info at this point. Some readers, however, have left their calculations within the comments. I hope that helps! I look forward to trying your Cottage Pancakes soon since I must increase my protein in my diet. Thanks! My pleasure, Patricia. Hope you enjoy them! Has anyone used almond flour or coconut flour instead of regular flour? I don’t recommend coconut flour in this recipe, Lori, unless you experiment with a smaller amount as it isn’t a one-for-one swap with regular flour. Almond meal could likely be used but the pancakes would probably be flatter. If you do any experimenting, please feel free to comment as to how you make out! Just made these and they were AWESOME! I used whole wheat pastry flour and omitted the salt. I love egg-y doughs, this will be one of my staples for pancakes from now on. Thanks! Fabulous, Ellen…thanks for taking the time to let me know! He could be heard throughout his floor wanting “his wife’s pancakes”! Children also love them as they don’t know what is in them – they are sooo light and fluffy and my neighbor started making them for her grandchildren. I’m so glad these have been much loved by so many, Edith. Thank you for letting me know, and I’m sending healing thoughts to your husband. These are fabulous. I am not a pancake eater because they sit heavy on my stomach. These were light and oh so good. Best of all easy to make ingredients always on hand. I agree with how these are lighter on the stomach, Brenda. Thanks for mentioning that very good point. I’m glad these were a hit! Based on the comments, I omitted the salt and added some vanilla to the batter. Then I made a topping with some cottage cheeses and good fruit spread blended. Yummy! How many calories are these pancakes ? Can I put blue berries in them before I cook them ? I haven’t made a practice of calculating the nutritional information for my recipes since there are often several variables at play in terms of product choices, options within the recipes, etc. Another commenter used a recipe calculator and left the following comment. I hope it helps! From Erin: I also just calculate the approximate nutritional value of approx. 20 of these delicious babies. I used low fat (2%) cottage cheese. This is only the value of 20 of them from the measurements used from the recipe. Any idea of the carb content per pancake? Look at the comment directly above yours for carb content and other details…and I hope you enjoy! Hi! I was wondering how much coconut flour i would use if I wanted to substitute it in for the regular flour? I haven’t tried these with coconut flour, but if I were to experiment, I’d start with 2 tablespoons since it’s so much more absorbent that wheat flour. If you try, good luck…and please report back! Flavor is excellent–reminiscent of a German pancake. Texture is perfect. I added a smidge of vanilla with excellent results. However, once they came off the cast iron, they were only about half as fluffy as I’d expected. How could I fix that? Glad you enjoyed the flavor and texture, Lindsey. One thing that could effect the fluffiness is the baking soda. Did you use it, and if you did, could it be old? If that’s not it, let me know and I will keep thinking! Hi Lynn, The baking powder wouldn’t cancel the soda out, but it would change the pH. It would be worth experimenting a bit more. If you try, please report back. We just finished eating out first batch!!!! Yum!! Have you ever tried coconut flour or almond flour instead if regular flour? Hi Tammy, I haven’t tried either in this recipe, but if you do try, I would use less coconut flour than all-purpose flour (maybe two tablespoons), as it is so much more absorbent than and not a direct substitute for all-purpose flour. Almond flour could be used in equal proportions, but you may find that the pancakes aren’t as fluffy. If you try, I’d love to hear how you make out. I make these all the time, they are a favorite in our house!! How many carbs please l’m doing low carbs,thank you. There are about 2.5 grams of carbs per pancake. Hi I’m new my daughter and I are celiac and dairy intolerant so can you please help me as i want to shed the weight as does my daughter and tone but i need ideas really appreciate as i have an under active thyroid gland which doesn’t help as i use to love training but got double whammy when got diagnosed with celiac and dairy intolerant! Hi Lynn, I have lots of gluten-free recipes on this site as well as recipes that are dairy-free or can easily be made dairy-free by choosing a non-dairy milk, for example. Take some time to look around and let me know if you are looking for anything special. Good luck and let me know if you cook anything! Sharing what I did for gluten-free – I used a half cup of almond flour to replace the flour, and added 3 tablespoons of ground flax seed. I blended it with a hand blender all together. It needs to rest for 30 minutes before making the pancakes. They were totally delicious! Had a texture very similar to a crepe. Thanks for sharing what you did for a GF version, Kim. It sounds fabulous! I used Greek yogurt instead of cottage cheese and they are amazing!! I haven’t tried these with Greek yogurt, so that’s good to know. Thanks so much for mentioning! Made these with my boyfriend, (first pancakes he’d *ever* made) and we both really enjoyed them. Halved the recipe, made them in a blender and added vanilla extract. They were light and airy yet quite filling. Will try them with blueberries next time. FYI we got about 5 “regular” sized pancakes. Thanks for a great recipe! I would love to upload this recipe into My Fitness Pal to share with others. I recommend you doing so!! Just did it, Tiffany! Hope that helps! Please upload this recipe into My Fitness Pal. It is an excellent alternative when you’re trying to cut carbs. How many carbs are in this recipe? Based on the number of servings indicated, they have about 2.5 grams of carbs per pancake. Love these with blackberries, Elizabeth! OMG! These are fantastic! The recipe makes a big batch so Im using the extras as bread for sandwiches. That’s awesome, Patti! And I never thought of using the leftovers as bread! You’re very welcome, Adina. Thanks for letting me know! I’m confused. I don’t see any actual recipe here. Just a picture an a description. I’m having a temporary glitch with the recipe card feature and hope to have it remedied quickly. I apologize for the inconvenience and will let you know when it’s fixed! Great idea, my daughter is on low carb diet, this recipe will surely help. I’ll surprise her tonight, pancakes with savory toppings.! What a nice surprise. I hope they were a hit with the savory toppings! Can the leftovers be frozen?!? They can be, Diane. Once cooled, they will also keep well in the fridge for up to a week. Hi Gulinda, Coconut flour is not comparable to other flours as it is far more absorbent. If you wanted to experiment with this recipe, I would recommend starting with 1/4 the amount of all purpose flour. I can’t say for sure how similar the results will be since I haven’t tried. If you do try, I’d love to hear how you make out! Thanks for the suggestion, Louise. I’d love to hear how you make out if you try. My son’s doc did he needs to eat a good breakfast every morning and that is a challenge. I don’t like eating in the morning either so I understand. But a growing boy going to school has to eat! I have been trying to find recipes where I can “hide” eggs and other proteins as he does not like eggs (sigh). Decided to try these on a Sunday and not surprise him on a school day…and although I didn’t fool him with the eggs I passed them off as “French Toast Pancakes” and he actually liked them! They are eggy but there is enough flour and baking soda to give a pancake look and feel and more carby texture. But they do smell and and tast more like french toast. Also, since there is very little carbs all that protein fills you up but you don’t need a nap afterwards. My husband, who is a pancake lover, loved the taste and also loved that he didn’t feel stuffed yet satisfied after he ate them. We have both had gastric bypass so carbs really make us bloated and feel like crap. I did omit the salt since a lot of people said it made them too salty. I would love more recipes like this that are full of protein yet don’t taste like an omelette! This one is a keeper! I’m so happy these were an all-around success, Bridgete, and so appreciate the feedback. I have a good number of healthy, high-protein options in the recipe archives if you have some time to look over them..and there’s more on the way! Hi Suz, I don’t typically calculate calories and carbs but do have a link to a user-friendly calculator in the Helpful Tips section. A reader did share her calculations though, so I copied them below. Hope you enjoy! Based on approx. 20 pancakes. She used low fat (2%) cottage cheese. These values will vary, but not by much, depending on the milk fat and sodium used in the cottage cheese or the type of flour used. She mentioned that she did not add any salt because her cottage cheese was salty enough. Hello Ann, I have made your recipe a couple of times and love them. A month or so ago I came across the original recipe for ‘cottage cheese pancakes’ given to me by a friend over 40 years ago! It was nearly identical, hers used 1 c cottage cheese, 1/4 oil and a 1/4 t. vanilla. You might want to experiment with the changes and see what you think. She too used a blender for 1 minute, all at once. I still remember making a pig out of myself and I had just met the woman. Sooo, good. Thanks for sharing. That’s awesome, Leah! What a gem! I will have to try that one of these days. I’m delighted you like this version and appreciate your taking the time to pass along your variation, which certainly has stood the test of time! My daughter who loves eggs found this recipe terrific. I did too; however my other daughter who is very picky knew something was amiss. She doesn’t like eggs and could taste the eggs. I’m delighted this was a hit for 2 out of 3! It is a tougher sell for someone who doesn’t love eggs! Best, lightest, most flavourfull pancakes I have ever tasted. This will be my only recipe from now on! Wonderful news! Thank you for letting me know! I made these today and was sad when they came out very flat! I followed the recipe to a -T- and they came out flat and tasting very eggy on their own. With some butter and syrup they were delicious though! I love the small ingredient list and the protein these pancakes pack. Any ideas on why they came out so flat? Hi Lara, What kind of flour did you use? There are details above the recipe regarding options I’ve tried other than all-purpose. If those comments don’t help, let me know and we can further trouble-shoot! I tried this recipe. They come out thin like a crepe. Which I love. Not thick like a normal pancake. You could easily add lemon and poppy seeds. Switch the flour for almond flour. Good flexible and quick. Hi Sally, It’s interesting that yours came out like crepes–maybe it was because the almond flour was less absorbent than regular flour–but I love that as an option. If you wanted to keep them grain-free but more like traditional pancakes, you could try using a little more almond flour. Thanks so much for your comment! I haven’t used almond flour in this recipe but I believe another person commented after making the substitution at some point. My recollection is that it worked but the pancakes were flatter than usual. I hope that helps, and if you try, I’d love to know how you make out! Could the flour be Almond Flour instead ? Coincidently Phyllis, the previous commenter just asked the same thing. This was my reply: I haven’t used almond flour in this recipe but I believe another person commented after making the substitution at some point. My recollection is that it worked but the pancakes were flatter than usual. I hope that helps, and if you try, I’d love to know how you make out! The pancake can be made with chickpea flour. Add finely chopped onion, grated carrots, chopped coriander. Sounds like a delightful savory option, Shuchi. Thanks for mentioning! can i keep for 1 or 2 days in the fridge or is it a one time food…? maybe i can try 50% of ingred. amounts… your opinion very important… thank you! Hi Betty, You could definitely cut this recipe in half, although the lesser amount of batter may be hard to blend thoroughly in a standard size food processor. It would definitely work in a mini processor. You could also make the full batch, cool completely, and then freeze some for later. The pancakes reheat well in a toaster oven. Hope this helps! Hi Debbie, Sometimes the print option opens in a new window on your browser. Check and see if that happened, and if you still can’t print let me know! Thank you for this recipie-these are a dieter/healthy eaters best friend! I used gluten-free Bisquick for the flour and coconut oil spray for the cooking. I used the blender for all mixing. Made myself an extra special large thin pancake, put a tablespoon strawberry jam, rolled it up and topped with a tbsp of yogurt-delish! Also, they freeze like a dream so I double the batch! That sounds fantastic, Linda. Thank you for the feedback and the helpful mention regarding the gluten-free Bisquick! What about making them with almond flour? Hi Cheryl, A few people have recently asked this question. Although I haven’t tried, I think almond flour would work but would yield a thinner pancake. If you try, I’d love to know what you think! I love love loved these pancakes. I purchased sugar free Mrs Butter-Worths syrup. I will make these again. I Will however omit the salt. It came thru a little much. But all and all. Delicious . I would love to figure out the Weight Watchers points. Thank you! I’m delighted these are a keeper, JoAnne! As I mention in the recipe, the salt really does depend on the brand of cottage cheese used. There’s such variation from one to the next. Perhaps another reader will be able to mention the WW points for you. I wonder if ricotta cheese were subbed what the results would be…. Hi Donna, I’d be inclined to try it, realizing that the texture of the finished pancakes could be slightly different (not necessarily worse!) due to slight differences in water and fat content. If you do try, I’d love to know what you think! I’d love for someone who has tried to weigh in, Jennifer, but I have not. I will say that the ratio of all-purpose flour to coconut flour is between 3 and 4 to 1, so you’d likely need somewhere between 2 to 2-3/4 tablespoons of coconut flour as opposed to the stated 1/2 cup of regular flour. In the 1960’s a similar recipe (Adele Davis @Prevention Magazine) used oatmeal instead of flour. I lost the recipe in Hurricane Camille (Cat 5, 1969 in Biloxi Ms.) My kids loved them and will try this recipe on my great grand kids! Thank you. Betty, I’m delighted you found a recipe that seems similar to the one lost so many years ago in what must have been a devastating storm–and I love that you will be cooking these for your GREAT grandchildren. How lucky they are to have you! Hi Rosz, I think coconut flour can enhance the eggy taste in recipes that have a good number of eggs. That said, I’m so glad you enjoyed the pancakes with your modifications and that they worked for your keto diet. Thanks for your comment! I have made these a dozen or more times. We love them!! I modify slightly to match my family’s taste. But these are perfect just the way they are! Wonderful, Terri! So happy you make these regularly for your family. Thanks for your comment! Blend it all in a blender. Add a small amount of ghee to an omelette size pan over low/med heat. Pour a 1/2 c. of pancake batter in pan and cook for approx. 3 min. each side. These pancakes are the bomb! Light and fluffy and very tasty! I spread on some Greek yogurt and add a few berries. Delicious!! I freeze the remainder of pancakes then reheat during the week. Making weekly meal prep a snap! Made these with almond flour and it seemed to work well. Tomorrow I’m going to try substituting ricotta cheese for cottage. Thanks for your feedback, Mikey, and so happy you enjoyed. I especially like your suggestion of trying with a lid…will try that myself. Good luck with the next batch! I’m not an expert on Keto eating, but full-fat dairy and eggs are typically fine. Grains are where you’d run into some trouble, so you’d have to use some form of nut flour. In this case, the pancakes would likely taste good but be a little flatter. I hope that helps! Just tried these. I used almond flour and put in the baking soda & powder you suggested. I left out the salt, added cinnamon and a bit of stevia. They do flatten, but I used them more as a crepe, put kodiak cakes first berry syrup and whipping cream that I whipped with stevia, vanilla and cinnamon. Even my keto- hating daughter thought they were good! That’s terrific, Katrina! I’m so glad they were a hit with your adjustments and that your daughter enjoyed them, too! Made these with almond flour today and they tasted fantastic! My daughter who does not like cottage cheese loved them! Love it when that happens! Thanks for your comment, Catherine! What is the calorie count? Hi Laurie, I don’t regularly provide nutritional stats but provide an easy tool (as well as the reason for this) in the Helpful Hints section. Several commenters have also noted the carb and calorie count if you’d prefer to scroll back through the comments. I was wondering how many carbs where in these?? Hi Cindy, Because of options I often provide within my recipes and because of variance inherent with different products, I don’t usually provide nutritional stats. I do have a user-friendly link in the “Helpful Tips” section of this blog that you may want to look at. Also, several commenters have mentioned the stats if you want to quickly scroll through them. Just wanted to let you know I made the batter the night before and they turned out wonderful. My husband said the recipe is a keeper! I’m delighted the recipe worked so well when the batter was prepped in advance. Thank you for taking a moment to follow up and enjoy those pancakes! Has anyone tried making the batter ahead of time and storing it in the fridge for a couple days? Just wondering if it will keep well so I can have it ready to go on work days. Thanks ! Hi Bailey, Coincidently, the commenter right before you made the batter the night before and said the results were wonderful. If you extend the advance prep by more than a day or two, feel free to report back! Tried these this morning with Almond flour. I added a small avocado and a little bit of Ghee to make the batter creamier and add a some good fat. My girls loved them. Love the addition of avocado, Drew. Thanks for mentioning and so happy they were a hit! That’s terrific, Trudi! Thanks also for mentioning your use of coconut flour and feel free to mention the amount you use in case others would like to try. I’m guessing you use less than the amount of flour called for? I tried making this recipe with almond flour, since it’s low in carbs, but it ended up looking like scrambled eggs, and tasting like poorly made french toast. If anyone there’s anyone else who tried making it with almond flour, please let me know how it turned out. Hi David, Perhaps others who have tried with almond flour will weigh in, but I think there are a few comments to that effect in the long list of comments that exists. Even with almond flour, I’m perplexed as to why the pancakes would resemble scrambled eggs. Did you blend the mixture or mix it by hand by chance? I’m happy to help troubleshoot! I used Almond flour in place of wheat flour and even though they came out a bit flatter, everyone loved them! Wonderful, George! Thanks for your feedback regarding the almond flour and so happy they were enjoyed!